Can you say, "Embarrassment of Riches?" 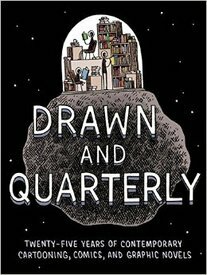 Drawn and Quarterly: Twenty-FIve Years of Contemporary Cartooning, Comics, and Graphic Novels is a 776 page hardcover overflowing with rare and hard-to-find comics published in out of the way nooks and crannies by some of the world's finest cartoonists, comickers and mangakas. It is also filled with family-album-style photos of these self-same creators side-by-side with each other as well as with D&Q staff, and more interviews and appreciations than can shake a stick at (not that you would want to). Here are some pics to give an idea of what's in store. Quite a treat!